That sickening crunch that means you've just had a car accident may only be the first in a series of shocks when it comes to your auto insurance premiums. In some cases, an accident can double your premiums. In others, it might not increase what you pay by very much, if at all. So how much more are you going to have to pay for your insurance after an accident? The answer is, it depends. When an accident occurs that results in a claim against the policy, the insurer usually tries to decide who is “at fault,” or principally responsible for the accident. In almost any two-car accident, the insurance company will apply a formula to assess fault, and consequently financial responsibility. Depending on your company’s underwriting guidelines, any accident in which you are considered at least 50 percent responsible can raise your insurance premiums. 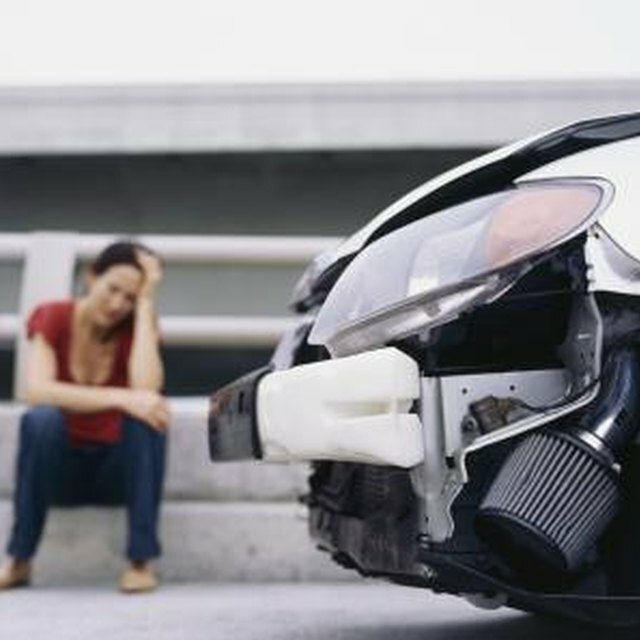 If your insurer determines that you're the one who caused the accident, or if there is no other driver involved (such as in the case of a collision with a large animal or a stationary object), there’s a good chance you will see an increase in your premiums when it comes time to renew your policy. This is considered a “chargeable” incident. If you’re cited as a result of the accident -- for running a red light or failing to yield, for example -- your insurance company will consider you automatically at fault. If you’re not responsible for causing the accident, it’s unlikely your premiums will rise. While many companies include an “accident forgiveness” provision in your contract, what that means is that the company promises not to factor in an accident in any future premium calculations. But it doesn’t necessarily mean -- and most insurance companies won’t explain this unless you specifically ask -- your rates are going to stay the same after you’ve made an accident claim against your policy. Even if your insurance company doesn’t factor in the accident when it comes time to renew your policy, your “at fault” status could cost you your “good driver” discount -- which can mean as much as a 20 percent increase in premiums. It's worth noting that policies that offer accident forgiveness are often more expensive than those that don't. It may not be worth the additional charges if the cost of your policy goes up anyway. If the accident results in injuries or damages in excess of a certain amount, often $750 -- it varies by company -- you’re likely to see an increase your premiums. Any accident that results from the driver being under the influence of alcohol is considered a “major violation” by most insurers and will increase your premiums significantly. If the accident was relatively minor and no one was injured, you might consider paying for any damage out of pocket and not reporting it to your insurance at all. If there are no claims made, then your insurer won't have any reason to raise your premiums. What Does Insurance Do When It Can't Find Who Is at Fault for Car Damages? The good news is most insurers won‘t factor in an accident that is more than three years old into your insurance premiums, so even if you see an increase when it comes time to renew your policy with your insurer, it won’t last forever. If an accident has raised your rates, it’s worthwhile to shop around to see what other companies can offer you. Even with an accident on your record, rates can differ significantly from one carrier to another for the same level of coverage. Forbes: How Does an Accident Forgiveness Provision Work?